What makes this photo for me is the groomsman sitting down, not caring a bit that we were taking a wedding party photo. He just wanted a drink, and the bridesmaid scolding him cracks me up. This is one my favorite spots in Cleveland for unique wedding photos. 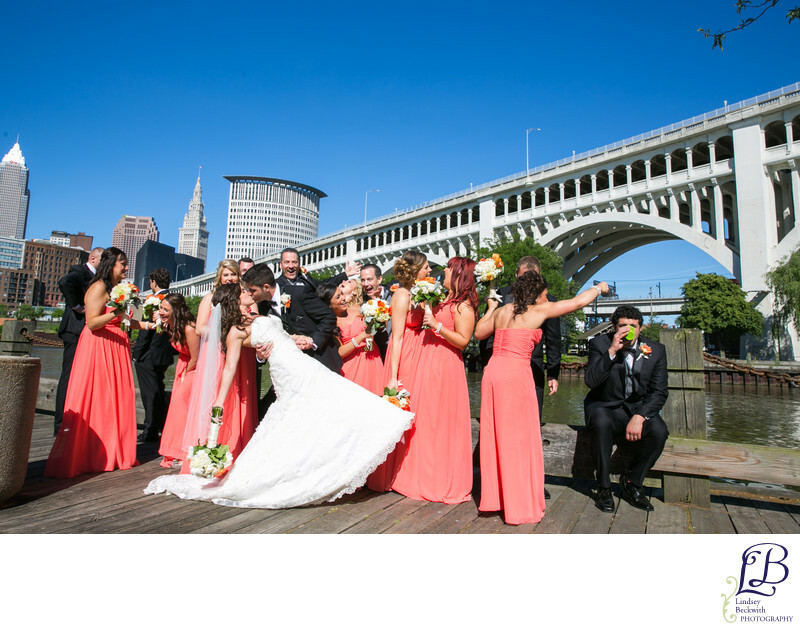 It shows some of the Cleveland skyline, and provides a beautiful urban setting for wedding photos. It's not your typical wedding photo location--which is why I like it. It's gritty, urban and beautiful, and speaks to Cleveland brides who want a fresh, unique setting for their casual, fun, photojournalistic wedding party photos. Cleveland wedding photographer specializing in raw, intimate photography. Keywords: Cleveland wedding photographer (987), Lindsey Beckwith (924).